State Reps. John Davis, Ed Thompson and Wayne Smith, from left, have a small reunion while attending the 5th Annual Maritime & Petrochemical Outlook Conference at the Pasadena Convention Center Sept. 4. Leaders from the petrochemical, maritime, logistics and transportation industries delivered robust economic forecasts for the Houston Ship Channel region during the 5th annual Economic Alliance Houston Port Region Petrochemical & Maritime Outlook Conference at the Pasadena Convention Center Sept. 4. More than 650 people listened to encouraging news about expansion plans amid a resurgent energy renaissance in Texas and the U.S. 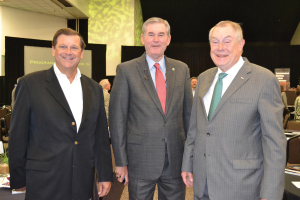 The Port of Houston Authority and the Panama Canal Authority gave presentations recognizing their growth as 100-year anniversaries are being celebrated for both the canal and the Houston Ship Channel. Port of Houston Authority Commission Chairman Janiece Longoria outlined capital investments that will help the Port Authority meet demand of regional expansion, calling it “an exciting time for business growth at the Port” and noting how the century-old “Houston Ship Channel has played a pivotal role in the economic health of our city and region.” Panama Canal Authority Market Forecasting Manager Silvia deMarucci addressed the status of the Panama Canal lock expansion, reporting that the project is back on schedule. 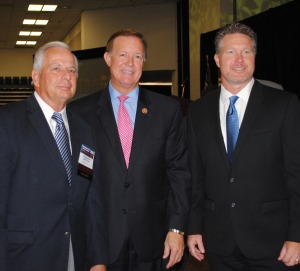 Economic Alliance President and CEO Chad Burke, right, welcomes Congressmen Gene Green, left, and Randy Weber, speakers at the 5th Annual Maritime & Petrochemical Outlook Conference at the Pasadena Convention Center. Todd Monette, chairman of East Harris County Manufacturers Association, said projections are that the region can expect more than $35 billion in plant expansion in the next several years – generating as many as 100,000 skilled construction jobs during the next three to five years, according to industry sources. U.S. Sen. John Cornyn of Texas, Congressmen Gene Green and Randy Weber, as well as Texas Commission on Environmental Quality Chairman Dr. Bryan W. Shaw told the audience that they would be vigilant in overseeing the regulatory environment and ensuring that unduly burdensome regulation does not dampen the energy renaissance in the U.S. Solutions to address the shortage of qualified workers were discussed during the outlook conference. Through a collaborative effort by the Economic Alliance, industry organizations and local community colleges like San Jacinto College and Lee College, a critical shortage of skilled workers is being addressed through “fast-track” certification programs. The Economic Alliance testified and supported recent changes in education to allow high school students to take specific curriculum to prepare them for high-paying middle-skills jobs. “I agree with Chairman Longoria,” Economic Alliance CEO Chad Burke said. “These are exciting times to be a partner with the Port of Houston Authority and the Houston Ship Channel refining and petrochemical industry. The energy industry’s resurgence due to abundant, affordable natural gas is good for U.S businesses,” said. “We are working to help our members expand their facilities, bringing in new companies and new projects. The Port of Houston Authority is the presenting sponsor of the Petrochemical & Maritime Outlook Conference. Shell Oil Company, San Jacinto College and Bay Group Media are gold level sponsors. Another 40 companies sponsored at silver and bronze levels.